Due to the many responses of “I want to see more of it!” from everyone, inside info on「Beautiful Love」will be released in a [Special Making Video]!! Following the camera, a lot of precious making footage and interview footage will be released over 8 weeks from 5:00pm on 8/18(Wed). Please also look forward to the super special footage on the actors’ thoughts and bare faces! [Info] 100816 Beautiful Love Kimi Ga Ireba Special Making Video Delivery is Decided! “Beautiful Love ~Kimi Ga Ireba~” which had been receiving everyone’s excitement finally reached its last episode. Watch more! In response to everyone’s inquiries, we decided to deliver a [Special Video] Inside ‘Beautiful Love’!! The interesting behind the scene footage & video interview starts to air on August 18th (Wed) from at 05:00 in over 8 weeks period. Please enjoy the special video where actors put their real expressions and feelings into the drama! 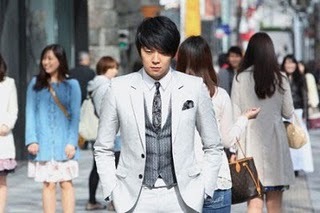 Yuchun, from Tohoshinki, which has paused all activities, had his Japanese drama debut! This was “Beautiful Love ~Kimi ga ireba~,”a BeeTV drama released on 4th of June. He challenges his first acting role sincerely, acting passionately as a prince that makes girls’ hearts beat faster. 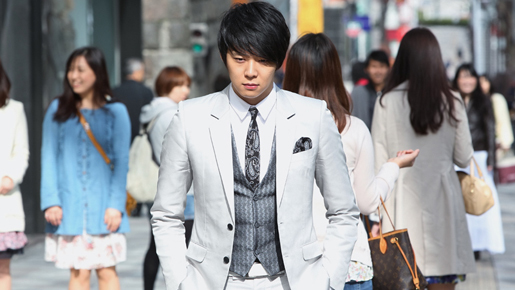 Yuchun plays the role of the heir of the Korean conglomerate Taido Group, Yonsu. Determined to fight for his own place in life, he meet’s Hinata (Aya Oomasa,) an aspiring novelist and the plot unfolds into a Cinderella love story. This hot-and-cold attitude of Yonsu’s is acted out beautifully by Yuchun. As the heir, when he’s alone, the way his expressions change is mesmerizing. Whether it’s assertive, or naïve, or the fragile prince-like image, he manages to charm all the women. Still, Yuchun was desperately practicing his Japanese, putting the other Japanese boys to shame. It’s hard to believe to that he has no acting experience, as he was very natural. While being a singer, Yuchun has also embarked on acting activities. It can be said that the first attempt in Japan has done well. Like a dream come true for Japanese women, please enjoy the princely style of Yuchun. 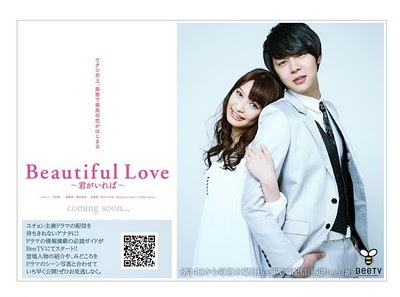 Yoochun’s first TV series in Japan, “Beautiful Love ~君がいれば~” starts airing through BeeTV in early June. The drama is about a handsome chaebol roled by Yoochun and Omasa Aya as a journalist dreaming to be a novelist, from their confrontations, gradually they start to understand each other, a kind of Cinderella love story. Even since the first day of video release, the number of download of this drama has been breaking the previous record by gaining 250,000 downloads, and together with “Making off ~ Beautiful Love ~” the drama has set a record to be the most viewed video for 4 consecutive days, definitely garnering its popularity! Yoochun with his own unique charm that is different from his bright performance on stage as a singer, as an actor identity, he has delivered a natural acting skills, creating topics/sensation. Meanwhile, the drama’s theme song “Kimi ga Ireba ~ Beautiful Love” and inserted song “Intoxication” is sung by Yoochun’s group mate Junsu and are included in XIAH Junsu’s first solo album. The album has recorded more than 200,000 copies sold. On his father’s orders, Youngsu/Yonsu arrives in Japan to take over a hotel. He seemingly changes his proud attitude during a conference with the reporters but explodes suddenly, talking about his complex feelings towards the Japanese. On the other hand, Hinata confirms how she truly feels about her boyfriend, but is unable to say it frankly. Youngsu/Yonsu discovers that there is someone following him on the second day, and starts to hide his whereabouts. This thus leads to the second meeting between Hinata and Youngsu/Yonsu. SEVENTEEN model Aya-chan and Asia’s big star Yoochun-san is co-casts on the Bee TV drama!! They told ST(seventeen) the behind the set story to us only. ST model Omasa Aya-chan co-casted with Yoochun-san who has many passionate fans all over Asia in a Bee TV drama!! Aya-chan plays the role of “loves to day dream and wants to become a novel writer that’s 22 years old” Hinata. Aya-chan (after this it will be Aya) “This is my first time playing a women that works. The outfit is different from usual and for the role I dyed my hair a bright color too. For the scene when I get drunk I asked my make-up artist before the scene “what am I supposed to do! ?” *laugh*. With the tight schedule, the filming took place in the Kantou area and it seemed that the filming was fun. And this was Yoochun-san’s first time acting in Japanese!! Aya: You said you couldn’t sleep either right? Aya: Yoochun-san’s acting and Japanese kept getting better and it made me amazed!! I only had a little bit of lines in Korean and I was stressed. I was really amazed that he remembered the lines without sleeping!!. The set had a bright atmosphere that was full with Japanese and Korean jokes. -Is there an episode of the first time you guys met? Aya: That time you gave me a CD right? Aya: Wait, don’t leave~*laugh*!! I was really nervous at first too. Its my first time acting with an artist. But I was able to become close with the staffs and other casts. Aya: Sometimes he would say something really weird. What was it, penpen? Yoochun: Oh!! “Oshiri penpen ball pen”♡ Its a Japanese joke!! On this interview day Yoochun-san cranked up (ended filming). Yoochun: I had someone write how to read the word next to the kanji on my script, practiced acting,and it was hard but it was a work that left a lot of memories. The pure love story ofcourse but please give attention to my acting too. Aya: There are sad scenes, and there are scenes that are like love comedy with Yoong-su! Like Hinata and Yoong-Su even though their first impression was the worst is there a time when you gradually started to get attracted to that person!? 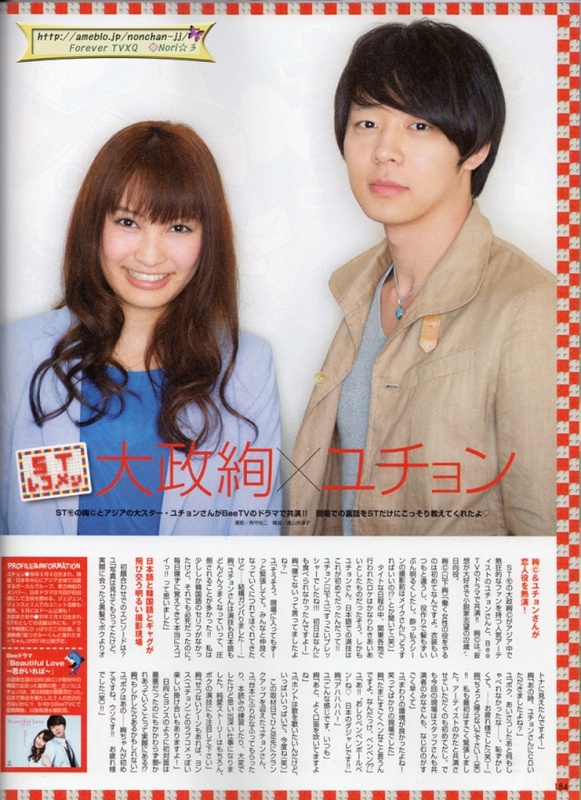 Omasa Aya and Yoochun, who possesses mega popularity in Asia, will both star in BeeTV’s new television drama. Omasa Aya acts as a paranoid 22 year old reporter, Hinata, who dreams of becoming a novelist. In a tight-packed schedule, the filming in the various locations in Kanto had a very amiable atmosphere. But this is still Yoochun’s first time acting in Japanese! Y: I feel a lot of pressure, so on the first day I couldn’t really eat anything. A: And you also couldn’t sleep? Y: Yes, and I was still very nervous once I arrived on-set. But once I became familiarized with everyone, I became a little bit more relaxed and worked hard. A: Whether it’s Yoochun’s Japanese or acting skills, they have both improved tremendously! I only know a little bit of Korean, so I have to study hard too. Instead of sleeping every night, furiously memorizing the lines is really impressive. How was it when the two of you first met? Y: Although I’ve seen pictures, meeting her in real life with her dyed black hair made her look more mature. A: At that time, I received a CD from Yoochun. A: Please don’t go back to that! (laughs) I was also really nervous at first. This is my first time acting with a music artist. But this time, whether it’s the staff or the other actors, it was easier to become familiarized with each other. Y: The atmosphere is also really good! It is one that never hears an end to laughter. A: But sometimes there will be weird conversations. It feels like a deliberate way of draining time? Y: Ah! Bum pen, ball point pen! (t/n: the beginning syllable of his joke matched with the last syllable of her sentence)… Japan’s gags. Y: Just like this type of feeling… most of the time. A: After that, we’ll always whistle. Y: Upon receiving the script with my Japanese name on it, it was pretty tough reading over it and practicing, but that’s what left a deep impression on me. Even though it’s an obvious love story, please take notice of my acting too.